The City of Scott$dale, in coordination with the fraud experts at American Traffic Solutions, Inc., placed a photo enforcement vehicle disturbingly close to the establishment where CameraFRAUD.com held a public volunteer meeting. The meeting, held on the evening of September 12th, was located at a Peter Piper Pizza on East McDowell Road, and was publicized for over a week in advance on CameraFRAUD.com. 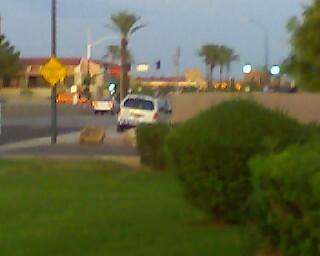 A marked “Scottsdale Police” photo enforcement van was illegally parked on the shoulder of McDowell, between the restaurant and the embankment for Eldorado Park. A quick look at the City of Scottsdale’s online scheldule of van locations shows that a new scheldule was generated on Friday, September 12th, and the van was set to be located at “7600 Blk E McDowell Rd E/B” between 4:00 PM and 7:15 PM. 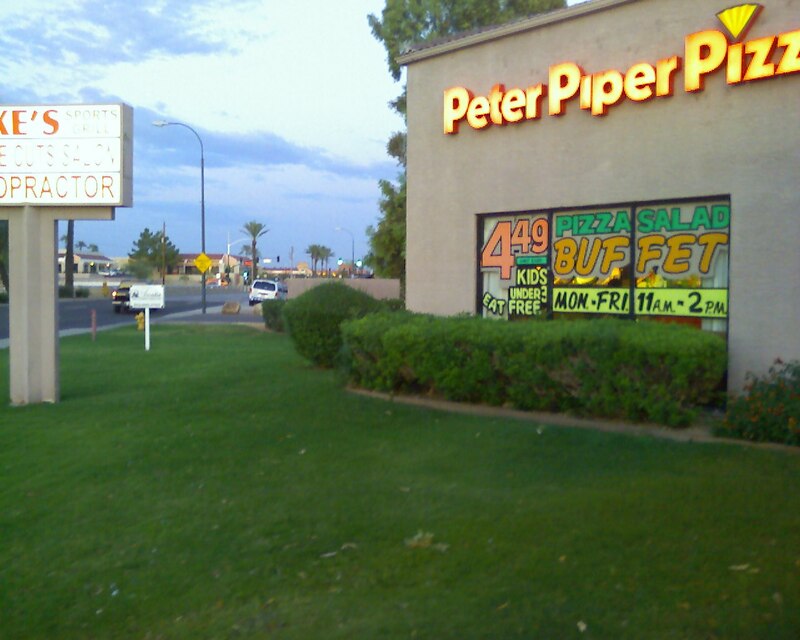 (Peter Piper Pizza is located at 7607 E McDowell Rd). The van was there until at least 8:00 PM. With hundreds of places where the vans could be located (multiplied by the various times of operation), the chances of such placement being an “honest mistake” seems highly unlikely— but not impossible. The City of Scottsdale has a clear record of attempting to squelch dissent with the recent arrest of a freelance journalist / videographer for local site FreedomsPhoenix.com. Now, one is lead to wonder if the city is actively attempting to intimidate businesses (and perhaps provoke) peaceful citizens who are guilty of no crime other than lawful assembly over a pizza pie. The Cameras are Coming Down. This entry was posted on Friday, September 12th, 2008 at 9:20 pm and is filed under News. You can follow any responses to this entry through the RSS 2.0 feed. You can leave a response, or trackback from your own site. They changed the location at the last minute. 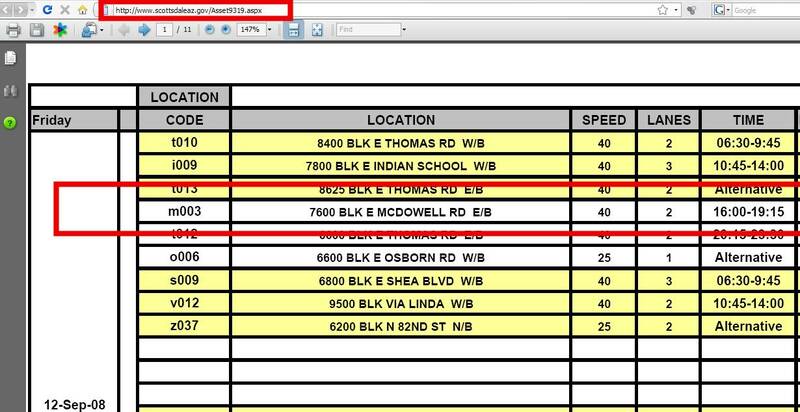 My list that I printed on the sept 10th shows that van being at 6600 e osborn on the 12th and the McDowell location as the alternate. When i went back to look at the list on the 12th the locations were the exact opposite almost like they wanted to place a van close to your event. I work across the street from that Peter Piper. In over two years I have never seen a camera truck on that stretch of McDowell. I don’t know how they were photographing eastbound traffic with the angle the truck was on. I’m not a conspiracy kook, but I find it more likely that the angle the truck was on allowed them to photo or tape folks entering the Peter Piper Pizza. Hope the meeting went well, and let’s send these clowns packing. Hi, I found this website after hearing on 1010 AM. I live nearby that Peter Piper Pizza but was out of town during the meeting. However, Within the previous few weeks, i had noticed a photoradar van in nearly the same position (as in the photo) , but on the North side of Mcdowell, between the automotive business and the bridge. I only observed the van in that position one time. I assumed it was setup to catch people speeding West-bound, to beat the yellow light. Cruel m0f-ers.